When a day outing calls for a unique and fun duffle bag. Arrive in style with our feather pattern multi-color quilted duffle tote bag. Sporting a bold design for this traditional southwestern pattern. Trimmed in navy piping with grosgrain handles. Zipper opening for easy access to contents. A roomy duffle with sturdy footed bottom. 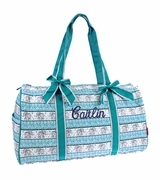 Add a bold white monogram to complete this personalized duffle bag. Southwestern pattern quilted duffle bag measures 20"W x 11"H x 10" across footed bottom. Inside wall zip pocket, lined with gingham cotton blend lining.